KENNEDY SPACE CENTER, FL--A powerful United Launch Alliance Atlas 5 rocket roared to life Friday and launched NASA's solar-powered Juno space probe on a five-year voyage to Jupiter, the first step in a $1.1 billion mission to look for clues about the origins of the solar system in the hidden heart of its largest planet. "What we're really going after are some of the most fundamental questions of our solar system -- how Jupiter formed, how it evolved, what really happened early in the solar system that eventually led to all of us and the terrestrial planets," said Scott Bolton, the principal investigator. "These are really basic questions, who are we, where did we come from, how did we get here? "We're kind of going after this recipe of how planets are made. We're getting the ingredients of Jupiter, we're going to understand what the structure is like inside, how was it built, and that will give us guidance as to what happened in that early time that eventually led to us." The towering 197-foot-tall Atlas 5, equipped with five solid-fuel strap-on boosters for extra power, ignited with a ground-shaking roar at 12:25 p.m. EDT (GMT-4), generating 2.5 million pounds of thrust and instantly pushing the spacecraft away from launch complex 41 at the Cape Canaveral Air Force Station. 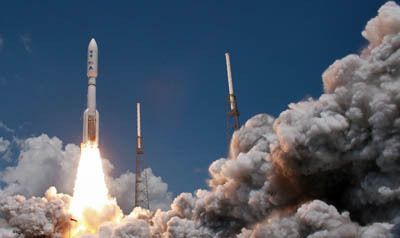 It was only the second launch of a five strap-on Atlas 5, the most powerful version offered by United Launch Alliance. Liftoff was delayed 51 minutes to resolve two technical issues and to make sure the launch danger zone was clear. Climbing away atop a brilliant plume of fiery exhaust, the rocket accelerated through the sound barrier 34 seconds after liftoff, arcing away to the East and putting on a spectacular lunchtime show for tourists and area residents. The strap-on boosters burned out and peeled off about a minute later and the first stage shut down and fell away as planned four-and-a-half minutes after launch. The rocket's hydrogen-fueled Centaur upper stage then carried out a six-minute burn to boost the spacecraft into a temporary parking orbit. A second nine-minute Centaur firing 31 minutes later accelerated Juno to 25,000 mph, or 7 miles per second -- interplanetary escape velocity -- and three minutes later, the 4-ton spacecraft separated from the Centaur to fly on its own. Juno's three solar panels then unfolded and initial checks showed the spacecraft came through launch in good shape and pointed in the right direction. "Next stop is Jupiter!" Bolton said during a post-launch news conference. "I could not be happier, this is sort of like a dream come true." Project manager Jan Chodas said the solar arrays deployed normally, "we spun down to .4 rpm as predicted and then the spacecraft spun us back up to 1 rpm as planned. We were left off about 19 degrees off sun, within the 20-degree cone that we needed, so we did not need to turn to put the arrays on the sun, we were already pointed in the right direction." "So everything was, our favorite word, 'nominal,'" she said. "I'm happy to say we are stable, we are spinning, we are power positive, the arrays are picking up power and recharging the battery, and we are commandable. So those are the four things we wanted today, couldn't be happier." 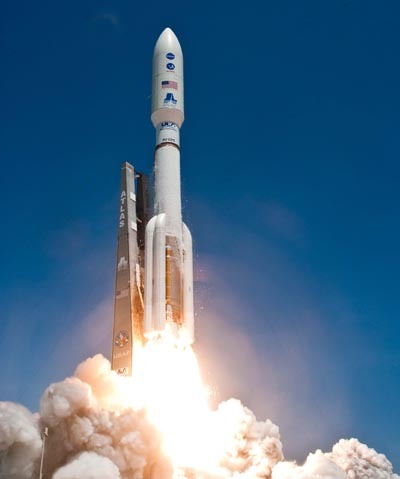 The Atlas 5 was not powerful enough to fling the spacecraft directly to its target. Instead, Juno will fly out past the orbit of Mars and then use on-board propulsion in September 2012 to drop back into the inner solar system for a velocity-boosting Earth flyby in October 2013. 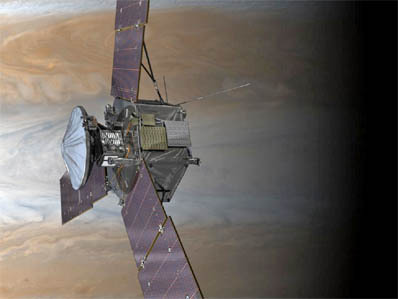 That will give Juno the extra push it needs to reach Jupiter on July 4, 2016. Braking into orbit around Jupiter in 2016, Juno will swoop to within 3,100 miles of the gargantuan planet's cloud tops once each orbit to collect precise data about its magnetic and gravitational field strength. But it will do so in an orbit around the planet's poles, ducking below the intense radiation belts that concentrate high-energy sub-atomic particles around the equator. Even in a polar orbit, Juno will be exposed to the equivalent of 100 million dental X-rays over one year. To survive in that hellish environment, the spacecraft's electronics are housed in what amounts to a titanium vault. But exposure to even reduced levels of radiation will reduce the spacecraft's useful life to about one year, or 33 orbits. At that point, Juno will be ordered to crash into Jupiter's atmosphere to prevent any chance of a future collision with one of Jupiter's moons and contamination of any presumed sub-surface oceans. All of the earlier spacecraft were powered by radioisotope thermoelectric generators, or RTGs, which used thermocouples to convert the heat produced by radioactive decay into electricity. Juno is the first solar-powered spacecraft designed to study an outer planet nearly 500 million miles out where sunlight is 25 times weaker than at Earth. As a result, three huge solar panels were required, each one the size of a tractor-trailer rig, arranged starfish fashion around the central body of the spacecraft. At Earth's distance from the sun, the arrays would generate 14 kilowatts of power. At Jupiter's distance, they will provide just 400 watts. But that's enough to power Juno's science instruments and subsystems. Spinning at 2 rpm for stability, Juno will probe Jupiter's powerful magnetic field, study its powerhouse auroras -- the most energetic in the solar system -- chart the movements of its colorful cloud belts, the churning Great Red Spot and other surface storms and use the planet's powerful gravitational field to probe the hidden interior where scientists believe a crushed, solid core may lurk under an unimaginable 40 million atmospheres of pressure. "If you were looking at the solar system from Alpha Centauri, for example, what you would see would be the sun, four planets and some debris," said Toby Owen, a Juno co-investigator at the University of Hawaii. "We're down in the debris. So it's like being an archeologist and you're surrounded by chips and pieces of marble, some pots, and you're trying to figure out where they came from, what kind of a civilization produced them, and we're sort of in that situation with the solar system. "We're in the debris, the bits and piece, and the reason we want to go to Jupiter is it should have preserved the original material from that disk, from that solar nebula as we call it. And so if we can study Jupiter, we have a chance of getting back in time and looking at conditions, the composition, that existed then." A major goal of the Juno mission is to determine how much oxygen is present. Jupiter should have roughly the same levels as the sun, but data from NASA's Galileo probe indicated that may not be the case. "Some of the heavy elements, carbon and nitrogen in particular, are enriched in Jupiter's atmosphere above the level that they have in the sun," Owen said. "Oxygen may or may not be, and that's one of the reasons we're anxious to find it. If oxygen is more abundant in Jupiter's atmosphere than the carbon and the nitrogen, we have to figure out how it got that way." If that is the case, Jupiter may have formed farther out in the solar system, where more ice was present in the original solar nebula, and then migrated inward. If Jupiter formed where it is today, Juno should detect roughly similar levels of oxygen, carbon and nitrogen. "If, on the other hand, the oxygen is lower than the carbon and nitrogen, then we would expect the oxygen has combined to make silicon, to make rocks," Owen said. "The rocks would have settled out and joined that big mass, the 10-Earth mass, in making a core. We don't know if that happened. But we have an experiment that may tell us about a concentration of matter at the center." 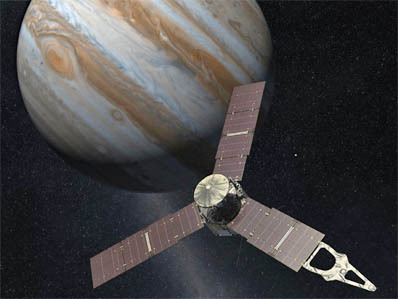 But carefully monitoring radio signals from Juno, scientists can detect subtle changes in the spacecraft's velocity caused by the effects of Jupiter's gravitational field. That will provide a direct measure of how mass in the planet's interior is distributed. "If we also have this information from the oxygen about the formation of rocks, then we'll be pretty much zooming in on the fact that Jupiter has a core, and this will be a very important result," Owen said. "Because that will tell us that this model for making Jupiter from a 10-Earth mass object is probably right." Looking at the bigger picture, Bolton said Jupiter's history is directly tied to Earth's, "because the stuff that Jupiter's enriched in, these heavy elements, everything heavier than helium, is what we're made out of, it's what the Earth's made out of, it's what all life is made out of." "We're trying to figure out what that history was early in the solar system of how these things got into Jupiter and how the planets got more of them than the sun did, because it obviously led to us."